Renters nationwide are out of luck — the average cost of rent jumped nearly 3 percent in April to an average of $1,405, according to property analytics provider CoreLogic’s Single-Family Rent Index, released Tuesday. Nationwide, median rent prices surged 2.9 percent in April and rose 0.3 percent year-over-year, according to the index. Las Vegas, Phoenix and Orlando experienced the most significant hikes, with each of those metro areas tallying year-over-year increases in excess of 5 percent, according to the CoreLogic analysis. “Rent prices increased significantly across the country in April, with the southwest region showing the highest growth rates,” said Molly Boesel, principal economist at CoreLogic, in a prepared statement issued Tuesday morning. Over the past several years, the rental market has been hit with some of the same challenges homeowners have faced, including low housing inventory. 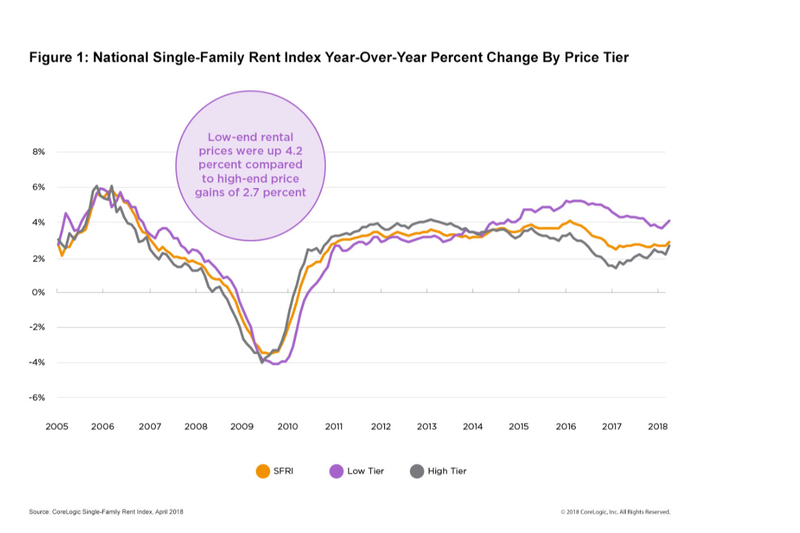 While rental hikes reached a peak of 4.2 percent in February 2016, prices have continued to increase since 2010, and in 2016 median rent reached a peak of $1,001, according to CoreLogic. Rising rental rates have been particularly severe among homes and apartment units priced 75 percent below median rent, a market in which prices have increased 4.2 percent since April 2017. Overall rent spikes, however, have been tempered by high-end rental properties, which have only escalated in price by 2.7 percent this year. Overall, a particular area’s employment growth could prove to be a double-edged sword for those looking for affordable places to rent — a strong economy promotes job growth but causes rents to rise. Consequently, cities such as Chicago and Honolulu did not experience the same spike in rents (for the latter, rent prices actually decreased for the sixth month in a row) but also did not experience strong economic growth. “National employment growth has remained steady in 2018, which could be a driver of continued rent increases,” Boesel said.